Use this article to further your knowledge around Chronological, Biological & Technical Age, and the difference between each one. Chronological age is simply how long an individual has lived in years, months, days, or a combination of all of these (e.g. 15 years, 3 months, and 12 days). Biological age refers to the biological status or maturity of the athlete depending on whether they are a pre-adolescent, adolescent, or an adult. Technical training age refers to an athlete’s technical ability in a given task (e.g. strength training or sport specific). In most circumstances, particularly in team sports, athletes are grouped based purely on their chronological age. Though this is very common, it can be problematic for a multitude of reasons. In the past two decades sports science and strength and conditioning have become increasingly popular professions, this growth has led to many practical and scientific progressions. One of which is the understanding of ‘individuality’, this infers that no two athletes are the same and that they can vary by gender, age, ability, physical and psychological maturity, anthropometrics, and training necessities – to name just a few. 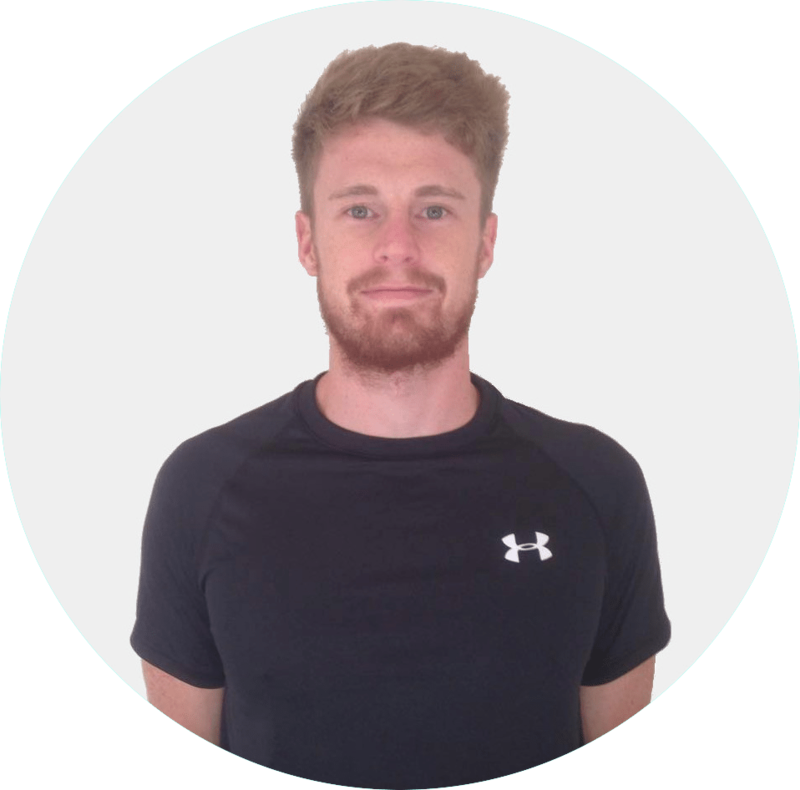 These variances mean that training programmes must be individualised in order to maximise the athleticism of each athlete and protect them from any personal predisposing injuries. In knowledge of this, exercise specialists have begun to categorise their athletes not only on their chronological age but also by their biological and technical training age – something often referred to as ‘bio-banding’. Whilst this principle should theoretically still apply for adult athletes, it may be suggested that it has only really begun to gain momentum in young athletes. The ‘ages’ may be described as typical or ideal group training categories in which athletes are separated. For example, team sport athletes are typically separated by chronological age, and in some circumstances technical training age. However, athletes are rarely separated by biological age. This form of age is simple and is the primary category coaches would subconsciously categorise their athletes into. Chronological age is simply the age of the individual by date of birth. For example, if the current date is February 2016 and an athlete was born in January 2000, then this would make them 16 years of age, or more specifically 16 years and 1 month. In most circumstances, particularly in team sports, this athlete will be compiled into a group with other athletes of a very similar age (e.g. Under-17s). This form of categorisation is often the most commonly adopted when working with athletes. However, the primary issue with doing so is the large variance between individual abilities, and this variance is often exaggerated in young athletes due to differences in both their biological and psychological maturity. For example, in an under-17 boys’ rugby team, some players may have almost reached full physical maturity, whilst others may have yet to undergo their peak height velocity. This can lead to large variances in physical and psychological maturity, and thus limit the physical potential of the athletes by potentially increasing the risk of injury, reducing inter-group competition and generating distractions, not to mention failing to cater for each individuals own training necessities. In comparison to chronological age, the classification of biological age is far more complex. This form of age is often determined differently depending on whether the exercise professional is calculating the biological age or status of a pre-adolescent, adolescent or adult. Though the biological status of adults can be accurately estimated, this requires medical expertise and extensive assessments (1, 2). On the other hand, the biological age or maturity offset of youths can be determined using non-invasive anthropometric measures that require minimal equipment (3). Analysing the biological status of a young athlete is typically done by calculating the maturity offset of the individual (predicted years from peak height velocity) by using several anthropometric measures – in most circumstances by using: age, standing height, sitting height and leg length (3). By objectively measuring the maturity offsets of a group of young athletes, training groups can be restructured according to their biologic status as opposed to their chronologic age. This allows young athletes to be categorised based upon their physical and psychological status and/or training goals (4). 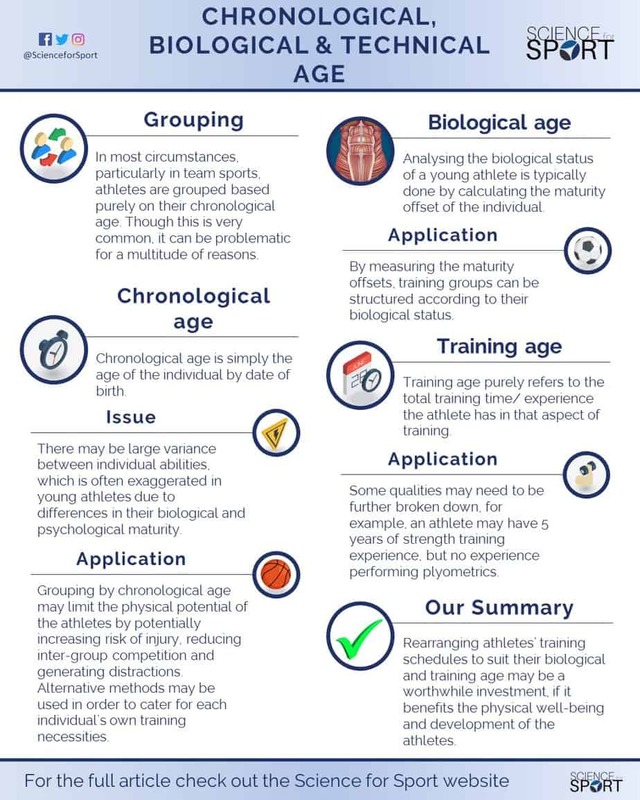 Availability is often the primary issue with categorising athletes based upon their biological age, especially when working with youth team-based athletes who have set sport-specific (technical) training times based on their chronological age. However, often like their technical training schedules whereby athletes are often moved up or down age groups based on technical qualities, similar principles should perhaps also be applied for their physical training programmes – i.e. athletes should be placed into groups with others who have a similar biological maturity. More often referred to as simply ‘training age’, this is a relatively straightforward classification. Training age purely refers to the total training time/ experience the athlete has in that aspect of physical training – i.e. whether its strength training, Olympic Weightlifting, plyometrics, speed and agility (5). An important factor to consider here, however, is just because an athlete suggests they have 5 years of training experience, does not suggest they are competent or have ever even performed all modes of training. For example, an athlete may have 5 years of strength training experience, but no experience performing plyometrics. Consequently, that athlete would be suggested to have a strength training age of 5 years and a plyometric training age of 0 years. 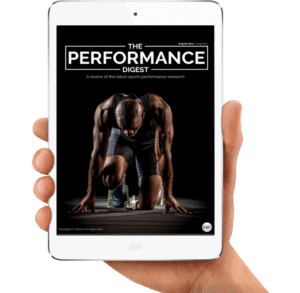 As a result, it is vital that the strength and conditioning professional considers all these elements and should test the athlete’s competencies before writing and administering any programme. Another major limitation to using training age as a form of categorisation is that quantity of experience by no means suggests quality. Just because an athlete has been strength training for 5 years, does not suggest they have had 5 years’ worth of high-quality coaching or achieved technical mastery. Again, the strength and conditioning coach must consider these factors and determine the athlete’s movement quality prior to administering any form of training plan. Though rearranging the athletes training schedules to suit their biological and training age can be difficult in team sport environments, it may also be a worthwhile investment if it is to benefit the physical well-being and development of the athletes. As previously mentioned, this restructuring is often implemented during technical training sessions, so should this not also apply for physical development sessions? Both the accessibility and usability of the internet has not only enabled faster progressions in sports science but has also made the information more easily available and led to a greater understanding amongst exercise professionals. Understanding the difference and importance of chronological, biological, and technical training age is imperative for the provision of strength and conditioning – particularly when it is the coach’s responsibility to maximise the physical potential of each athlete. Sports Science entails many, many topics. 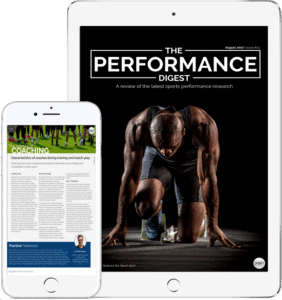 By choosing to simply read up on Chronological, Biological & Technical Age and ignore the sea of other crucial Sports Science topics, you run the risk of being detrimental to your athlete’s success and not realising your full potential. To make you an expert coach and make your life as easy as possible, we highly suggest you now check out this article on Monitoring Growth.